A former Royal Marine has become the first Briton to be killed while fighting with Kurdish forces against the Islamic State (IS, formerly ISIS/ISIL) militants in Syria. The former Marine has been named as Konstandinos Erik Scurfield, 25, from Barnsley. He was killed near the city of Qamishli on the border with Turkey. The Syrian Observatory for Human Rights earlier told AFP a European citizen had been killed fighting with Kurdish People’s Protection Units (YPG) on Monday. A British pro-Kurdish activist reportedly informed Scurfield’s family of his death. Ex-US soldier Jordan Matson, 28, who joined the Kurdish People's Protection Units last September, wrote on Facebook: “We were together from his first day here and you couldn't ask for a more disciplined warrior. “Kosta as we call him was from the United Kingdom and was born a Greek citizen. He served both in the Greek army and as a British Royal Marine commando up until he came here. He served with me in Jezza and Shengal. “Kosta volunteered for every attack and guard duty opportunity. He wanted nothing more than to bring the fight to the enemy. “I'm going to carry on your legacy brother, I will never forget you. I love you man. John Foxx, an American who fought alongside Scurfield in The Lions of Rojava unit of foreign fighters within the YPG, also paid tribute to his “brother” on Facebook. “Words cannot describe how I feel right now … I have lost family members, close friends, buddies in the Corps, but nothing has hurt as much as losing one of my Chappy brothers from the YPG. Scurfield had reportedly been fighting in an area southwest of the town of Tal Hamis, which Kurdish fighters seized from the Islamic State last week. It’s thought he was hit by mortar during a firefight with IS militants. 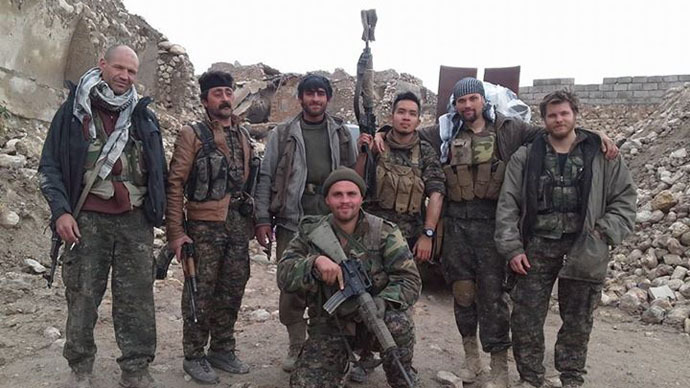 A photograph showing a smiling Scurfield, kneeling in the ruins of a Syrian town alongside other fighters, also features Ashley Johnston, 28, an Australian man who last week became the first foreigner to die in the fight against IS. Britain’s Foreign Office said it was difficult to confirm these reports. It said in a statement: “We are aware of reports of the death of a British national in Syria. Around 100 Westerners are believed to have joined Kurdish forces in Syria as well as other militia fighting against IS, including Assyrian Christian forces in Iraq.